Carlton bowler Mario Olivier is glad to have opening partner Ali Evans back this weekend while Mazars Grange will be out for revenge as they head to Grange Loan for the Capital derby. When the two sides met in the CSL Eastern Premiership in week two of the summer back in early May at Raeburn Place, Grange’s batsmen were blown away by the Carlton attack, South African Olivier taking five wickets as the hosts were all out for 74. Carlton then went on to wrap up a nine-wicket victory and with the sides both very much in the title race tomorrow’s return fixture takes on added significance. 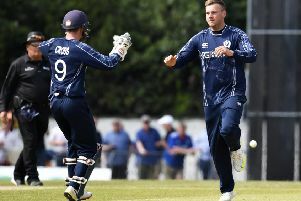 After last week’s match against Heriot’s was cut short, Carlton are able to recall captain Steve Gilmour and leading wicket taker Evans, the latter having recently been on Scotland duty. They replace Kyle and Ruari Macpherson in the XI and Olivier said: “We have been a bit frustrated by the weather in recent weeks, but there is nothing we can do about that and we are looking forward to taking on Grange once again. “The boys have told me about some of the great matches with them in previous seasons and it was good to win at their ground earlier in the summer, but we know they are dangerous. “It is great for us to have Ali Evans back in the team because me and him enjoy opening the bowling together and we try and put the opposition under pressure early on and let the other bowlers keep that going. To date Olivier has nine league scalps for 2016 while fellow seamer Evans has 13 and they will be key to stopping the likes of Nick Farrar, Ryan Flannigan and Preston Mommsen getting the visitors innings off to a quick start with the bat. Mommsen returns to the Grange XI after Scotland duty. It will be his first match back at Grange Loan since he left Carlton in the winter. Henry Edwards and Henry Philip are also in the team along with Andrew Appleton. Leaders Watsonians are on the road to fourth-placed Forfarshire. For the trip to Broughty Ferry, Ewan Chalmers’ men have Tom Cullen coming into the side to replace Fraser Sands. Skipper Chalmers has been in superb form withscores of 92 not out, 91 and 52 not out coming from his last three league innings – and he will be keen to continue that. Heriot’s have James Hearn back in the side to replace Kevin McLaren as they prepare to head for Arbroath. Elsewhere, Aberdeenshire host Stoneywood-Dyce and Glenrothes are at Falkland. Meanwhile, in the Baillie Gifford ESCA Championship, Marchmont will be keen to build on what was just their second league win of the campaign last week. That came against RH Corstorphine and tomorrow they face a tough test away to leaders SMRH. Second-placed Carlton II are away to Mazars Grange II at Fettes School while third placed Stuart&Stuart Penicuik are on the road to Kelso. Holy Cross are bottom and still winless. They are at RH Corstorphine. Edinburgh host Dunnikier.